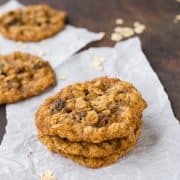 These chewy oatmeal raisin cookies are lacy and thin and perfect with your afternoon coffee or tea! Read my tips for freezing – it’s great to brighten someone’s day! BABIES. I love babies and I love bringing new moms (and dads!) food. I’ve talked about it in depth before when I shared my Chicken Tuscan Pasta Bake, and my feelings have not changed. Ben’s cousin just had a new baby and although we won’t be able to visit for a few weeks, I’m already planning what goodies I’m going to bring them. Well, when you have a baby, you get a lot of visitors. PS: Read my tips for visiting new babies but please don’t send me hate mail. So when you have a lot of visitors, sometimes you feel compelled to feed them and entertain them. Even just after giving birth, many of us moms feel the need to be Susie Homemaker or the perfect hostess. The fantastic thing about sending cookie dough balls is that they can pop them in the oven when they get these sometimes spur-of-the moment visitors. The visitors arrive, the house smells like freshly baked cookies, and they’re greeted with warm and chewy oatmeal raisin cookies. THE NEW MOM WINS. She’s amazing! She’s the envy of the town! How does she do it? Everyone is so impressed. She has it all together! I make the new moms promise not to tell anyone our little secret. And I make them promise to use parchment paper so they don’t have to do any dishes. Just kidding, I don’t make them promise to do either one of those things but I do highly recommend it. Everyone deserves to feel like a domestic goddess even though they’re leaking fluids from goodness knows where and they can’t button their pants. To freeze cookie dough for a gift, scoop it out onto a tray (find one that fits in your freezer) lined with parchment paper. 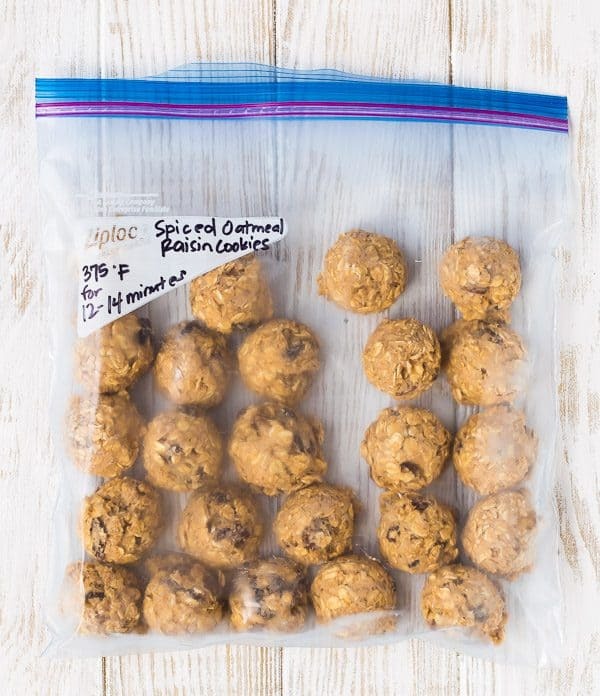 Place it in the freezer until it hardens, and then transfer into a zip-top bag or other freezer safe container. Label it with the name of the recipe and baking directions. Tip: I love to use a cookie scoop to form nice uniform dough balls – this is the size I use. It also makes them nice and round which looks a little nicer if you’re gifting them. If you really want to be a superstar, include a box of parchment paper sheets for the new mom to use on her cookie sheets! Freezing the dough on a tray first prevents the dough balls from squishing or sticking together. See how lovely they look? The bag was fogging up inside because they were frozen and Michigan has been unseasonably warm, but they still look great! I’ll let you in on a secret – many of my friends and relatives have admitted that sometimes these never make it to the oven. I know how that goes a little too well! I teamed up with Bob’s Red Mill to bring you this recipe; they too are passionate about spreading love through special care packages like this one. They shared with me that psychologists have found that baking for others makes the baker feel as good, if not better, than the recipient. Sounds like a win-win to me! 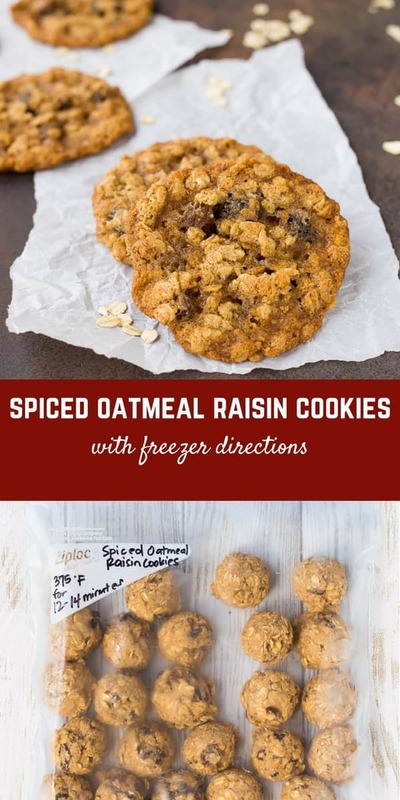 To make these cookies a little different from a standard oatmeal raisin cookie, I added a few extra spices beyond the usual cinnamon. There is still plenty of cinnamon in these, but I also added nutmeg, cardamom, ginger, and cloves. Not only do they smell incredible while they’re baking, they also give you a little taste of all those holiday spices without being an overtly holiday cookie — they’re great for any time of year. Tip: Want these cookies to stand out from the rest a little more? Try using jumbo raisins, dried cherries, or dried cranberries! I also used whole wheat flour in these cookies. I adore whole wheat flour in cookies; I think using it instead of all-purpose adds a great layer of flavor and texture to cookies. If you don’t have it or prefer all-purpose, by all means use that! My family is very accustomed to nearly exclusively eating whole wheat flour, so they don’t even really know the difference. And then of course, the star! 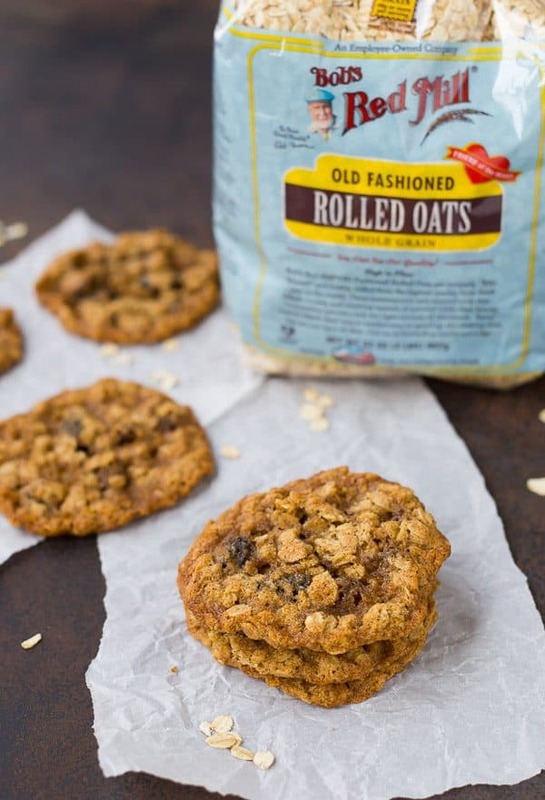 Rolled oats! 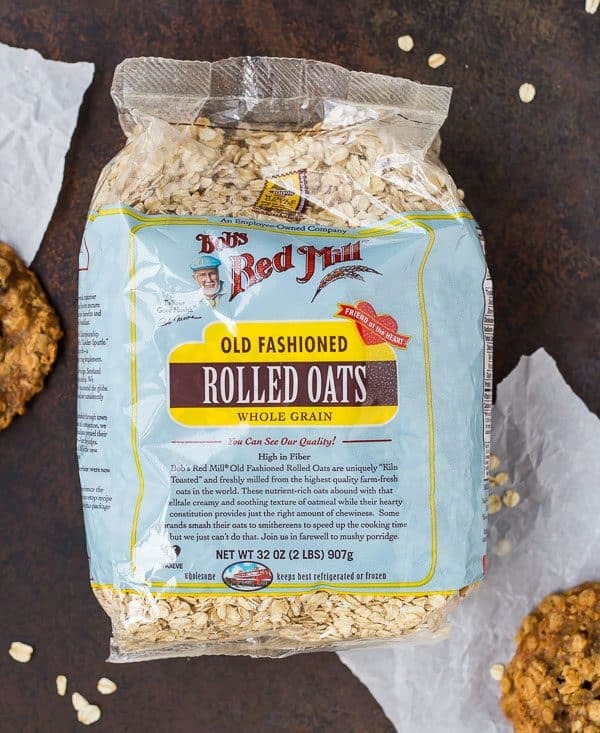 Bob’s Red Mill also makes thick-cut rolled oats which I LOVE using in granola recipes. 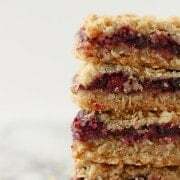 Either type will work in this recipe for chewy oatmeal raisin cookies, but don’t go near steel cut or quick cooking oats for this recipe, okay? Check out more delicious healthy recipes, snag coupons and find stores near you at BobsRedMill.com! In large bowl, combine sugar, brown sugar and butter; beat until light and fluffy. Add eggs and vanilla and beat until combined. Add flour, baking soda, baking powder, cinnamon, cardamom, salt, nutmeg, cloves, and ginger. 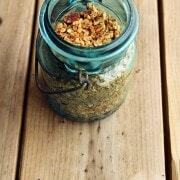 Mix to combine dry ingredients with wet ingredients. Fold in oats and raisins. Scoop dough by heaping tablespoonfuls (see note 3) 3 inches apart on prepared cookie sheets. Bake for 12-14 minutes or until edges are golden brown. Cool 1 minute before removing from cookie sheets and placing on a wire rack to cool completely. Freezer Directions: Drop by heaping tablespoonfuls onto a tray lined with parchment paper (make sure the tray fits in your freezer!). Freeze until hardened and then transfer to an airtight freezer-safe container and store in the freezer up to three months. Bake as directed in the recipe, adding 2-3 minutes to the baking time as needed. Note: You may use all-purpose flour instead of whole wheat flour if you want. Note: Do not use steel cut or quick cooking oats in this recipe. Note: I use a size 40 scoop which is 1 1/2 tablespoons. Note: These are fragile, lace-like cookies. 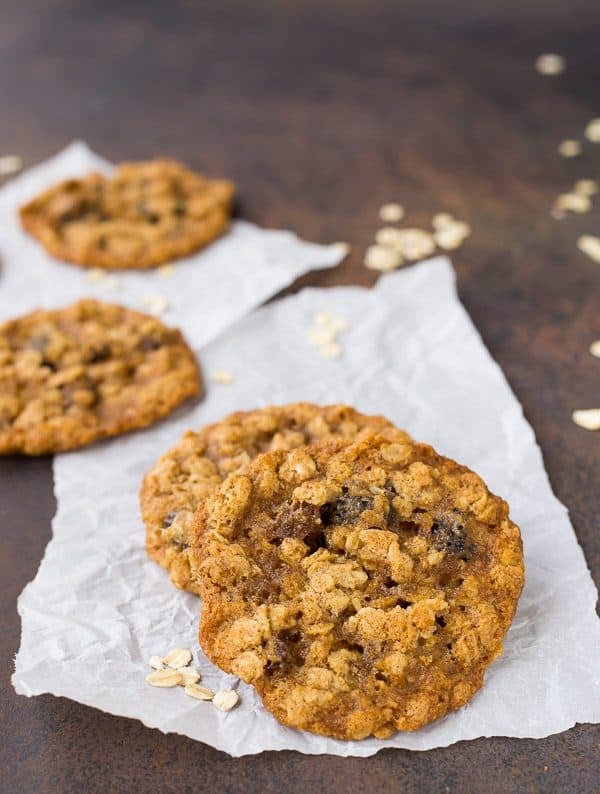 If you’re looking for a thick and dense oatmeal cookie, this isn’t the one! Verdict: These chewy oatmeal raisin cookies are a delicate but chewy cookie, and I love that! They’re not overly dense like oatmeal raisin cookies can often be. You’ll find yourself reaching for two or three of these! Husband’s take: Ben loved these! As I always say, I’m sure he’d prefer his favorite whole wheat chocolate chip cookies, but truthfully, he’s happy with any cookie I make. Changes I would make: None are necessary! If you prefer, this recipe would also work with all-purpose flour in place of the whole wheat flour. Disclosure: I’ve partnered with Bob’s Red Mill as a brand ambassador to bring you this post and these chewy oatmeal raisin cookies. They compensated me for my time but all opinions are, as always, my own. If you opened my cupboards and fridge, you’d find a wealth of Bob’s Red Mill products that I have purchased myself. Thanks for supporting Rachel Cooks by reading about brands I use and love! 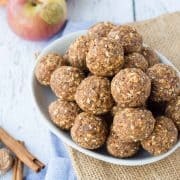 I made these and froze them in flattened balls but after baking they didn’t melt or spread out at all and just had dry lumps of oats. What did I do wrong?Admittedly used porridge oats as I had run out of rolled oats.